When Jamiah Williams sat down to watch the St. Jude Telethon, an annual event dedicated to raising money for children’s cancer research, she did so simply to spend some quality time with her mother. Little did the 9-year-old from Detroit know that just a few months later she, too, would be diagnosed with cancer. Following surgery and grueling rounds of chemotherapy, Jamiah felt nauseous, weak and sick. She became sedentary. Doctors thought she would benefit from some sort of physical activity. So, she was introduced to Kids Kicking Cancer, a Michigan-based nonprofit that uses martial arts techniques to help children with cancer ease their physical and emotional pain. “We transform the tears from the pain of a child into laughter and, more importantly, into power and focus,” explained Rabbi Elimelech Goldberg, 56, the group’s founder and international director. Goldberg, who is an assistant professor of pediatrics at Wayne State University School of Medicine and first-degree black belt in the Korean art of Choi Kwon Do, lost his 2-year-old daughter to leukemia 32 years ago. Her death led him to dedicate the rest of his life helping children with cancer manage their pain. According to the American Cancer Society, cancer is the second-leading cause of death among children in the United States. More than 12,000 children under the age of 15 will be diagnosed this year and some 1,340 will die. In Michigan, 493 children and teens were diagnosed with cancer in 2008, the most recent year available. In 2009, cancer claimed the lives of 67 children and teens, reports the state Department of Community Health. KKC, which offers its services free, held its first martial-arts class in 1999, for a dozen patients at Children’s Hospital of Michigan. Back then, Goldberg -- or Rabbi G, as he’s known -- ran the program alone and maintained an office in the basement of his home. Today, KKC has 12 employees (and dozens of volunteers) who support 2,200 children with acute and chronic illness worldwide. This includes 400 kids in Michigan like Jamiah. 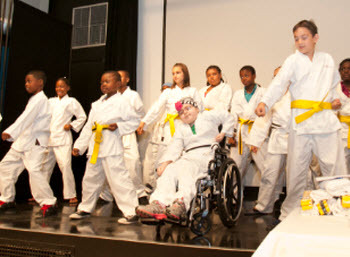 The martial artists who lead the classes are black belts who have spent several years working with pediatric cancer patients. On a typical day, Chief Instructor Richard Plowden first greets the students, who wear traditional white training uniforms provided by KKC. The students are encouraged to participate regardless of where they are in their cancer treatment or healing process. “How you feeling today, Champ?” Plowden asked Barry Smith Jr. Barry, 12, is battling osteosarcoma, or bone cancer, and is new to the program. He was too sick to stand that day, so he participated in the exercises from a seated position. “Where should our eyes be?” Plowden continued. “Straight ahead!” the students reply. Everyone stood or sat at attention, with their hands by their sides. You could hear a pin drop. “Focus,” Plowden commanded in a comforting tone, as he led students through guided imagery, meditation and basic martial arts moves. KKC continues to expand its reach across the globe to help children and families in crisis. Aside from Michigan, the organization serves children in New York, Los Angeles, Florida and Canada. The company recently launched a program at the Vatican Children’s Hospital in Rome and will be starting a program in Israel this summer. Groups from Guatemala and Portugal are interested in the program, too. “God willing, we hope to spread across the globe, because what we do is very simple yet powerful,” said Goldberg. Jamiah, now 14, can attest to that: She’s currently in remission and an honor-roll student at Consortium High. Back in 2007, when doctors removed 70 percent of her liver, they told her there was a chance that the cancer would return. KKC is a 501(c)(3) nonprofit supported by individual donations and foundation grants. For more information about the program, visit kidskickingcancer.org or call (313) 557-0021. Dana Hollowelljust completed her term as the first Center for Michigan student fellow. An award-winning journalist, she has experience in the broadcast and print media. Hollowell grew up in the Detroit metropolitan area.